I have the "Questions" page of the site set to display the 50 most recently active questions. At the moment, at least 40 of those are there only because a particular user is on a retagging crusade. Please do not do this. It means that genuine new questions do not receive the attention they deserve. A little retagging is fine; completely filling the front page of the site with old questions interferes with its functionality. My view is that necessary mass edits to accomplish retagging projects that have been discussed and generally agreed upon in Meta are inevitable, because that is more-or-less the only way to achieve certain tasks within the limitations of the StackExchange software (short of manual staff intervention). See Is it okay to 'flood' the front page?. However, there is a difference between that case, where the cleanup in question was discussed in Meta, approved by mods, and carried out on a one time basis, and what is happening here, which is an endless stream of petty edits to years-old questions to adjust tags and make them conform to personal style preferences of spelling and grammar. While I appreciate the significant amount of effort involved in this endeavor, presumably out of a desire to improve the site, it has been counterproductive. To put it simply, floods of edits do harm. They push site activity off the front page, which means it's less likely to be seen. The site relies on an array of trusted users seeing as much activity as possible so that new questions can be answered, new answers read and voted upon, and problems, such as spam and non-answers flagged. Mass edits bury all that activity. That harm can be offset by the benefit of the cleanup effort, but that only works if the effort has a reasonable benefit. And when I see the site flooded with hundreds of non-productive edits on a daily basis, my natural reaction is to close the tab, because wading through days worth of tag changes in search of weightier content is not an enjoyable way to spend my time. And many of the edits we're seeing just aren't particularly useful. To pick some random examples, these: 1, 2, 3. Why is it a problem for some old questions to have both luggage and luggage-storage? Yes, a suggested style is to apply the most specific tag, but we're not paying by the tag here; the categorization and searchability of the question was fine as it was. Here, luggage-storage and left-luggage are synonyms; nothing is really gained by removing one. Here, a perfectly understandable year-old question was edited to make it conform with one user's personal style preferences, changing numbers to words and correcting the small mistakes of a non-native English speaker, for no discernible benefit to anyone. 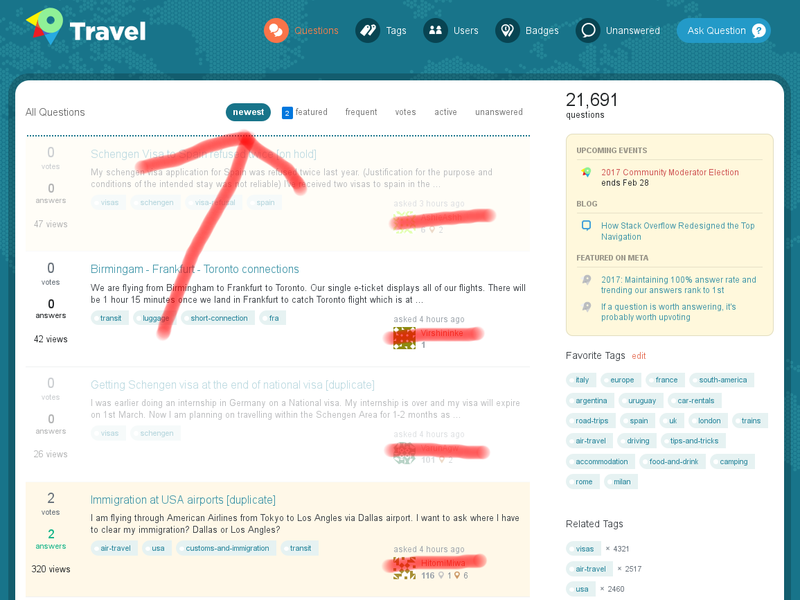 In short, the purpose of the site is to ask and answer questions about travel, not to maintain a taxonomy of tags or a corpus of prose that meets our personal whims. To the extent that retagging and editing helps to serve that purpose, we should continue to do so, after discussing large batches of edits on Meta to reach a consensus. To the extent that mass edits actively harm the ability to use the site for its intended purpose, we should prohibit them. I believe in editing to improve quality, be it a content edit, a tag edit, or a title edit. I also believe that editing old posts to improve them and to render them compatible with our current guidelines and standards makes perfect sense. The goal of SE is sites is not solely to answer questions but also to build a library of Q&A to serve as a reference. To that purpose one must perform housekeeping duties every so often. Going back to improve old posts is a part of such housekeeping duties. Unfortunately, the way SE sites are designed, edited posts are bumped to the top of the page. A corollary to this problem is that multiple subsequent edits to different posts can flood the home page and cause the newer questions to be "disappear" below the edited ones. The thing is that this is a classic case of [tag:status-bydesign] and should be accepted as such. What we can do is maybe try to find ways to work around the problem. Personally, I am perfectly fine with edit sprees flooding the home page, provided these aim at improving the quality of the post. Retagging a questions is definitely a way to do so. Is it okay to 'flood' the front page? Can we stop with the buses? Can you please make question titles comprehensible and complete?